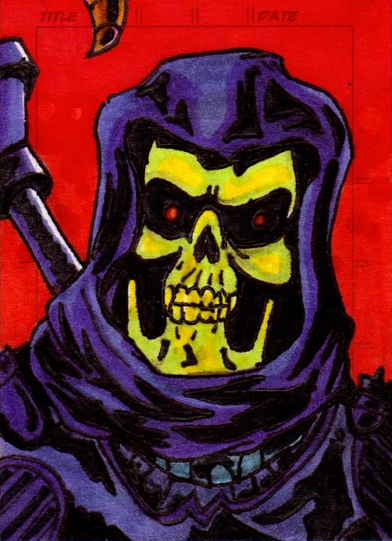 Taylor's Sweet Little Art and Nerd Site: Sketch Card of the Day- Skeletor! Skeletor or Ole' bone head! There are not too many people in the world who do not know the name, "Skeletor". When the 200X series of action figures hit the market, I was extremely excited about the new design that Skeletor rocked. He looked so cruel and evil. I liked him a lot when I was a kid, but due to his new design, he won my heart in 2002. If you know the 200X design well, you should understand what I am saying. 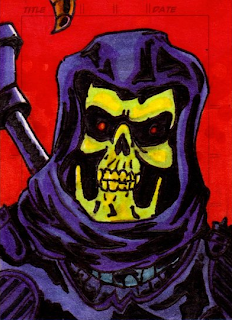 So this piece is an older sketch card that I did way back a year or so based on the 2002 toy of Skeletor. You can also see this piece in my deviantart gallery here. Big news! I've been invited to be one of the many talented artist to have work featured in a one night vinyl toy show called, "Vinyl Thoughts 4: Free for All" in Dallas on September 12th 2013. If you plan to be in the area, stop by and check out all of the cool custom vinyl toys.